UnitedHealth Group’s stock may not be as sickly as it seems, according to one investor. Shares of the health insurance provider have lost nearly 12% in the last week, or roughly $34 billion in market cap. 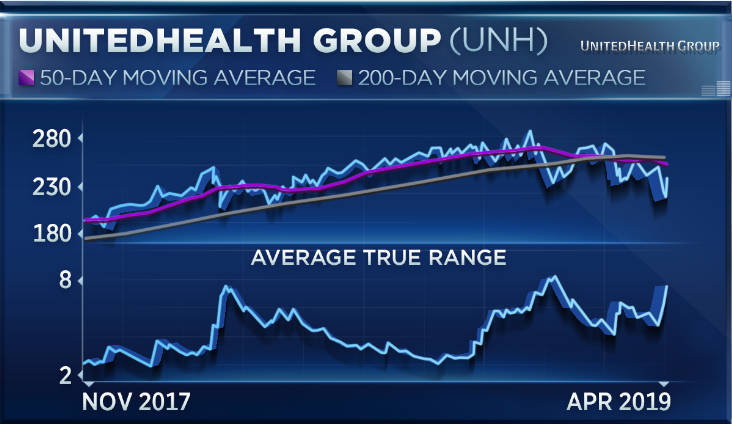 The weakness continued Tuesday after UnitedHealth reported earnings, with the stock shedding as much as 6% at the lows of the day. Its action was markedly different from that of fellow health-care giant Johnson & Johnson, shares of which surged about 2% after the pharmaceutical company’s own earnings report. “We own both stocks and I think they both had excellent quarters,” Binger said Tuesday on CNBC’s “Trading Nation,” calling Johnson & Johnson a “high-quality company” with consistent performance and a good yield. Binger may have been referring to what some — including UnitedHealth’s CEO — see as a looming threat to the nation’s health-care system: a series of “Medicare for All” proposals being promoted by some Democrats. Blue Line Futures President Bill Baruch wasn’t so convinced. “I cannot be a buyer of UNH after this bad day and even worse week, and here’s why. The average true range, which is a measurement of volatility, is broadening as we’re seeing new lows and lower lows,” he said in the same “Trading Nation” interview. He does like the stock of Johnson & Johnson, however, noting that it’s managed to hold above its trend line from 2016. Shares of UnitedHealth made a new 52-week low on Tuesday, ending the day down about 4%. UnitedHealth was up nearly 1 percent in Wednesday’s premarket. Johnson & Johnson’s stock closed about 1% higher. It continued slightly higher in Wednesday’s premarket.